Literature > Authorship > Technique. Literary composition, etc. We, Robot does for robotics what Michio Kaku's bestselling Physics of the Impossible has done for physics. How close to becoming reality are our favorite science fiction robots? And what might be the real-life consequences of their existence? Robotics and artificial intelligence expert (and science fiction fan) Mark Stephen Meadows answers that question with an irresistible blend of hard science, futurist imagination, solid statistics, pop culture, and plenty of humor. 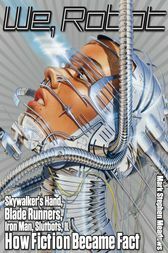 "Deftly balancing pop culture examples and lighthearted references with hard science and numerous glimpses of cutting-edge experimentation in robotics, cybernetics, and AI, We, Robot is half-chronicle of the quest for robotic advancement and half-examination of the increasingly hazy line between machine and man. Peppered throughout with gorgeous photography of projects both unnerving and unbelievable, the book is an impressively thorough tribute to all things robotic. Awash in footnotes, research, and firsthand interviews and observations from several hotspots of robot, android, and automaton innovation, We, Robot is as up-to-date as it gets, and it's a stunning look at our latest attempts to turn fiction into fact." Mark Stephen Meadows is the author of I, Avatar: The Culture and Consequences of Having a Second Life and Pause & Effect: The Art of Interactive Narrative. The award-winning co-inventor of four patents relating to artificial intelligence and virtual worlds, he is a respected international lecturer and the founder of Echo & Shadow and HeadCase Humanufacturing—companies involved with artificial intelligence. Visit him at markmeadows.com.